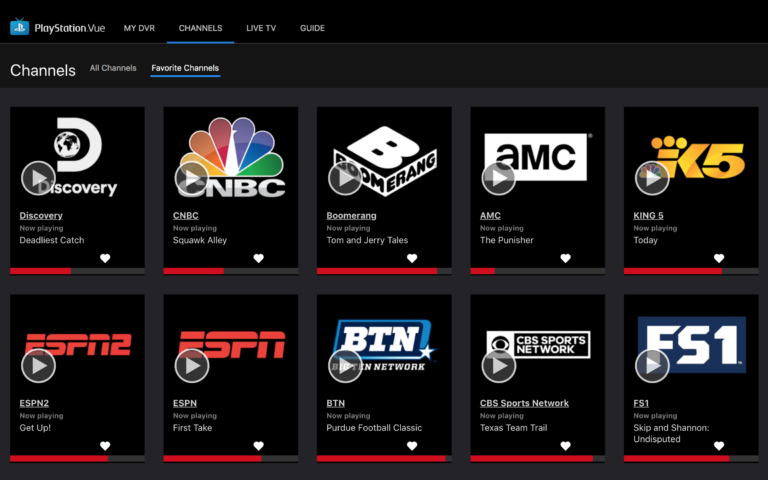 If you want to stream live sports, PlayStation Vue is your best option. 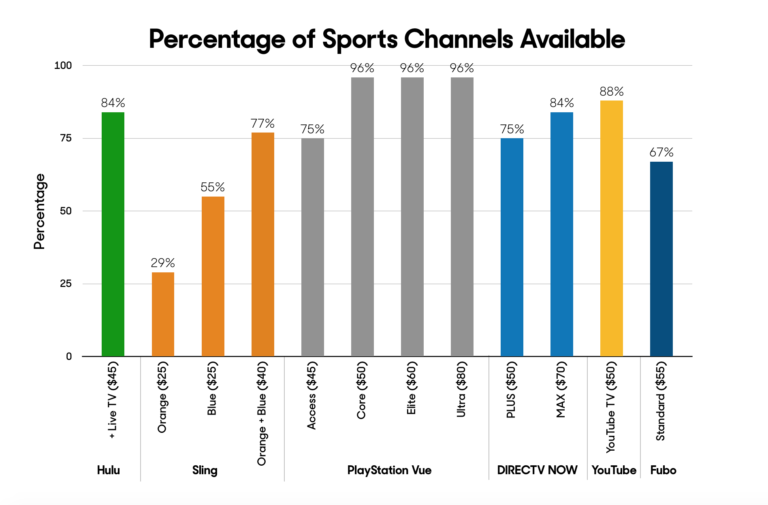 In our evaluation of the best streaming services for sports, it came out on top for nearly every major sport, offering nearly every channel that shows live sports in the U.S.
PlayStation Vue has more channels that air live sports in the U.S. than any other streaming service — and most traditional cable TV packages. You’ll be able to catch most of the games on lots of streaming services; only PlayStation Vue lets you watch all of them. The $50 “Core” plan comes with every channel that shows live sports for NFL, MLB, NASCAR, NBA, and PGA — more than any other streaming service. 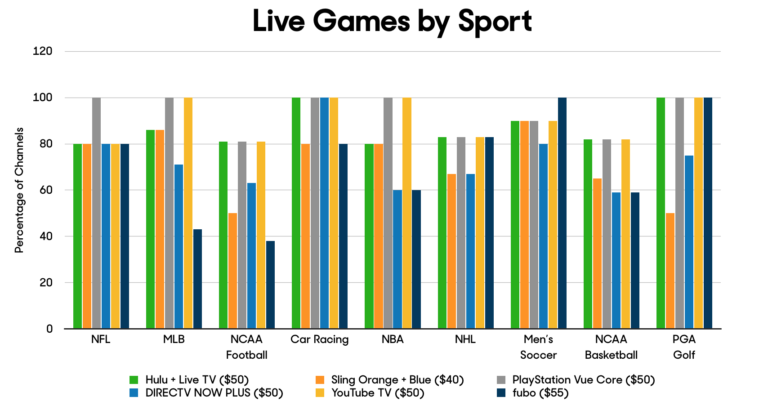 PlayStation Vue allows access to more live sports channels than any other streaming service. That’s because it includes each league’s independent channels like the NFL Network, MLB Network, and NBA TV. For college sports fans, it also has as many channels that show NCAA games as any other service, including the Big Ten Network, SEC Network, and ESPN U. But you don’t just want to watch the national games. PlayStation Vue also has an extensive collection of regional sports networks (RSN), which are the channels that show your local MLB, NBA, and NHL team’s games. It has every Fox Sports and NBC Sports local affiliate, plus independents like NESN and YES. You should check your zip code first, but chances are you’ll be covered. PlayStation Vue is also the only streaming service that lets you stream your RSN from out of market, so if you’re traveling on business or visiting family, you can still catch your team’s games. PlayStation Vue also has a lot of sports news channels in its $50 lineup: five ESPNs, FS1 and FS2, CBS Sports Network, and NBC Sports are all included. This isn’t entirely unique — Hulu also has these channels — but it was still significantly more than most services. The only sports for which PlayStation Vue isn’t the best option? NHL and European soccer. You’ll be able to see most NHL games, but it doesn’t have NHL Network in any of its packages. Sling (for an extra $5/month) and DIRECTV NOW (on packages starting at $124/month) are the only providers that currently carry it. Soccer is the only sport for which PlayStation Vue isn’t the best option. If you want to watch European soccer games, fubo is a better option. It has 11 different channels of beIN Sports, plus it’s the exclusive broadcaster of La Liga, Serie A, Ligue 1, Copa del Rey (excluding the final), CONMEBOL World Cup Qualifiers, Football League Championship matches, and Real Madrid TV. PlayStation Vue carries nearly every channel that shows MLS games, but for European matches, you’re mostly out of luck. PlayStation Vue has a solid all-around lineup of channels, including the “big four” local networks, Discovery, and FX. But if you’re not a major sports junkie, there’s probably a better streaming package out there for you. Big names like History, A&E, Comedy Central, Lifetime, The CW, Nick, MTV, and VH1 aren’t available in any of PlayStation Vue’s packages. If you don’t care about catching every single game from the sports you follow, you’ll probably find better value with Hulu + Live TV. There are a lot less holes in Hulu + Live TV ($45). 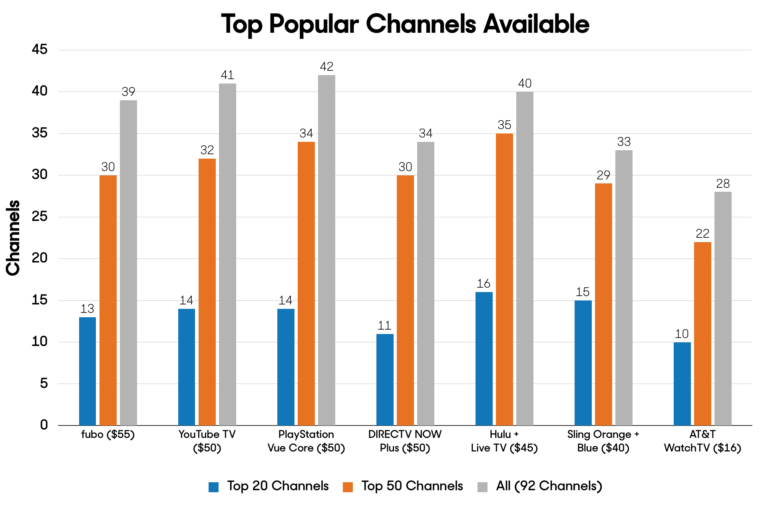 It has every one of the top 10 channels consumers said they want in an à la carte TV package, according to TiVo’s Q4 2017 Video Trends Report. However, it doesn’t have any of the NFL, MLB, NBA, or NHL’s league channels, so you’ll miss some nationally televised matchups, including about seven primetime NFL games per year. To see how it actually felt to use PlayStation Vue, we spent about five hours watching March Madness games on a Macbook Pro, Amazon Fire TV, and Roku Streaming Stick. While it doesn’t necessarily “spark joy,” the experience was perfectly fine. It basically feels like scrolling cable TV, an experience so apparently flawless that every live streaming service has done its best impersonation of it. PlayStation Vue preserves the experience of surfing cable TV, with one exception: Channels are scrolled horizontally in the guide instead of vertically. The one twist is that PlayStation Vue has you scroll channels horizontally instead of vertically. This was a little disorienting at first — it’s the only one of the live streaming services that does this — but we grew to like it after a while. It might show you a couple fewer channels at a time, but you see more programs from each channel at once, which seemed like an improvement. We also appreciated how, when you scroll up to see what was on previously, PlayStation Vue slaps a bright green “on demand” tag on programs that you can access immediately (almost everything). Gone are the days of TV FOMO. (For upcoming programs, you’ll have to add them to your DVR and access them after they air.) You can also choose “start over” on most programs if you happen to come in late. While it doesn’t feel all that different from a cable TV interface, PlayStation Vue takes a couple small steps that do actually improve on this standard. Each account allows for 10 user profiles, which can then be personalized based on what they watch. Each user can choose as many favorite channels as they want that will always show up first in their home screen. This felt legitimately useful for anyone who tends to go to the same handful of channels over and over — it saves you from scrolling through the entire lineup. Finally, PlayStation Vue is compatible with Alexa, Siri, and Google Assistant voice control, but it’s functionality is limited to basic commands like “play,” “pause,” and “rewind.” On an Amazon device, you can ask Alexa to play a certain channel — “Alexa, go to Fox Sports on PlayStation Vue” — a valuable time-saver. Siri- and Google Assistant-enabled devices allow you to search for specific programs instead of channels. PlayStation Vue truly goes above and beyond its competitors when it comes to some of the extra perks it offers. It has unlimited cloud DVR storage, so you can record as many shows and movies as you want without worrying about saving enough space. They delete after 28 days, but YouTube TV and Philo are the only other services to offer unlimited storage. PlayStation Vue is also the most generous when it comes to how many devices can watch at once, offering five simultaneous streams — two more than any other live streaming service. There is a slight catch: Only three of those can be streamed outside of your home. So you won’t be able to split one account with five separate houses. Still, the five simultaneous streams is a godsend for families with diverse viewing habits. No matter what your streaming device of choice, PlayStation Vue probably works with it. It has some of the best device compatibility in the business, with one obvious exception: You won’t be able to stream it on non-PlayStation game consoles.